The term of membership starts in January each year. If you have not joined the Society, it is now a good time to become a member of the Society. Old members are reminded to renew their membership by paying the Subscription Fee. For application or renewal of membership, please fill in your subscription form and send it together with the Subscription Fee to the Society's P.O. Box 98898, Tsim Sha Tsui Post Office. 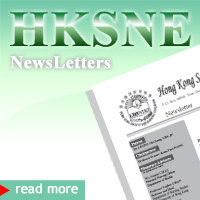 Please pay by crossed cheque made payable to 'Hong Kong Society for Nursing Education Ltd.'. *No initial fees for new members or re-joining members are required.